Don is a versatile subwoofer which complements the rest of the loudspeakers with a powerful and deep bass. You can select the paint of the membranes between silver (4 Ohms) and black (8 Ohms). The passive radiator Wavecor PR310WA01 is not longer available. We changed it to the new Wavecor PR312WA02 in the silver version. The Detonation DT300 amplifier is not longer available. We changed it to the Audaphon AMP-2200 with DSP. The Audaphon AMP-2200 have a power of 2x 200 Watts on 4 Ohms, or 1x 350 Watts on 4 Ohms in bridge mode. The Audaphon AMP-2200 has two DSP controlled RCA outputs for using with other components, for example to set a high pass filter for the main speakers. 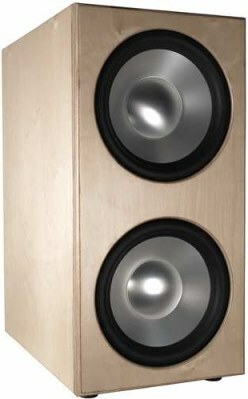 Don is a loudspeaker with drivers of Wavecor . A passive radiator brings out a deep bass.